Matis shared her book's music playlist today with Largehearted Boy editor David Gutowski. Check it out here. Aspen does an Interview with Brazos Bookseller AND a Guest Post on Book Club Girl! Read her interview here, and her guest post here! 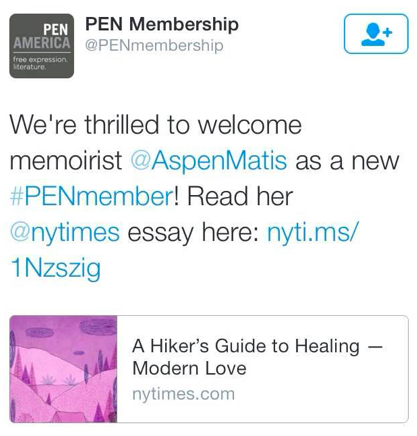 "Aspen Matis began writing when she was nine-years-old and has continued putting stories onto the page ever since. But two years ago, Matis signed a book deal with HarperCollins to write her own story...Writing is never an easy process, but Matis dedicated herself to the task by assuming an eight-hour a day writing schedule. Matis says, “Writing ideas, triggers ideas which means, in my experience, one day off is really two days lost. For this reason, I committed every day to showing up with all of my intelligence.” Matis knew that those with nine to five jobs don’t have the liberty of taking a day off if they happen to be suffering from writer’s block, so Matis treated the writing of Girl in the Woods as a job." "Aspen fled to the sanctuary of the woods. For six months she walked a single path from Mexico to Canada, through alpine snowstorms and blood-red deserts, her only company the occasional stranger headed the same way. At any given time she carried no more than 20lbs, including all the food, water, clothing and shelter she needed to live – no knife, no water filter, no winter jacket, no hiking boots. After over a hundred, grueling 25-mile days, she covered the total 2650 miles needed to complete the entire Pacific Crest Trail – a feat fewer people have accomplished than have climbed Mount Everest." New "Girl In The Woods" Press from YAHOO, The Daily Free Press, and Trail To Summit! Click here to read these great pieces! 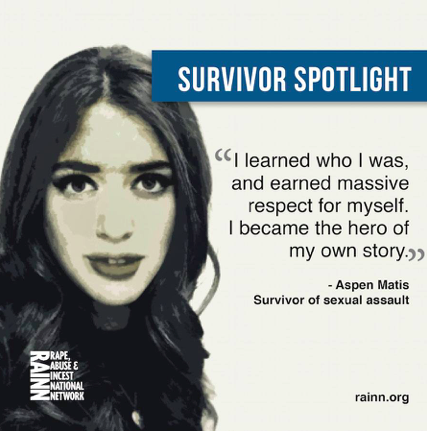 "After being raped on her second day of college, Aspen Matis dropped out and took on one of the most difficult hikes in the country. 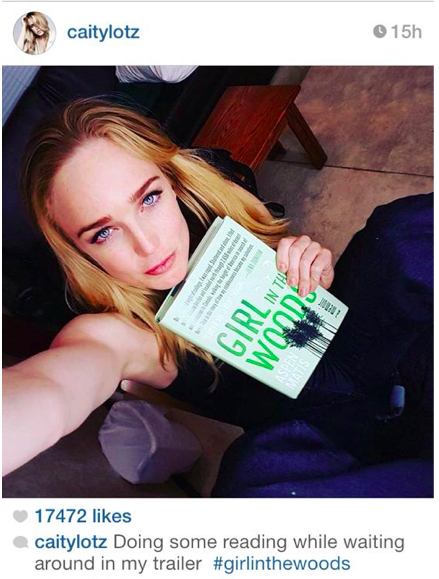 Now, her memoir, "Girl in the Woods," is getting widespread acclaim." 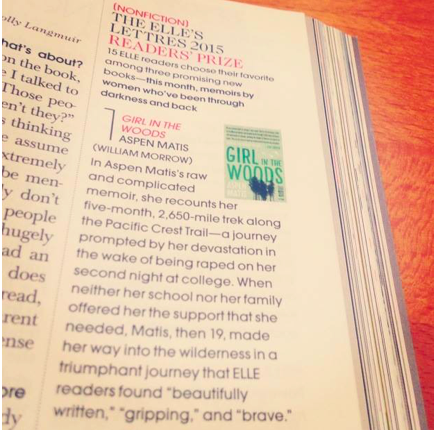 The New York Times calls Aspen Matis "A Hero"
O Magazine calls "Girl In The Woods" a "powerful read"
More Press for "Girl In The Woods" in The Gateway! IS NOW AVAILABLE ON AUDIOBOOK, READ PASSIONATELY BY ACTRESS STEPHANIE TUCKER.